Any home begins with a foundation, and the strength of the whole building depends on its choice. The base is chosen, first of all, depending on the type of soil on the site and the load exerted by the structure. The foundation for a brick house is often made tape, pile or slab. Tape foundations are quite in demand in construction , as it is able to withstand significant loads from massive concrete structures. It is arranged both under the bearing external walls and under the internal ones. During the construction of the strip foundation, you can safely create a basement or basement. In this case, the foundation tape will play the role of walls. This foundation is structurally divided into monolithic and modular. 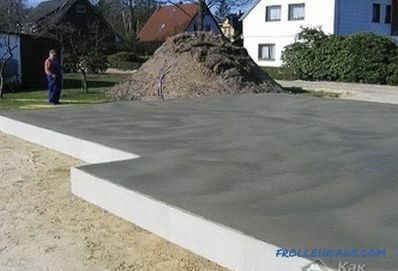 The monolithic foundation is a single reinforced concrete structure. When creating a precast foundation, blocks of concrete or stone are used. It is built relatively quickly, but requires the involvement of additional workers and special equipment. 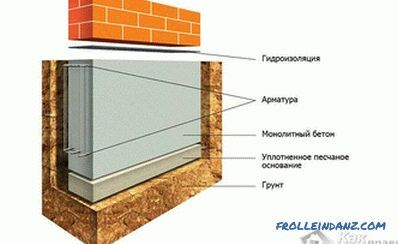 Monolithic foundation has relatively large strength characteristics. Belt foundations are shallow and deep. For a brick house is suitable the second option. In addition, if in the project there is an underground room, then the base of the foundation should be deeper than the level of soil freezing by 0.3 m.
The selected area is given the turf is cut in order and the future foundation is marked, the corners must be equal to 90º. If the project of a brick house provides for the construction of a basement or ground floor, dig a pit of the desired size. Otherwise, digging a trench. Dimensions of the excavation should be 1.5 times larger, since it will be necessary to have free space for pouring concrete into the built formwork. The bottom is horizontally aligned and theododite (if available) checks the angular depth marks. At the device of the strip foundation of a monolithic type, the bottom of the trench is first moistened with water, and then a fine fraction is made of sand and gravel. 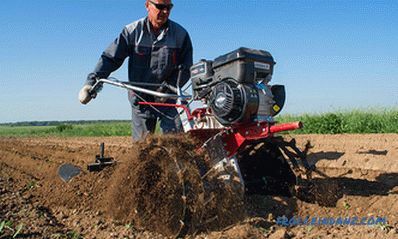 The thickness of the layer of the mixture should be 0.2 m. Then a vibrating plate is used for compaction. 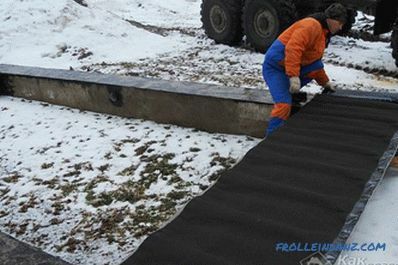 A waterproofing material is laid on the compacted cushion, after which it is the turn to fill with lightweight concrete. When creating a precast foundation, the work is done the same, only the cushion is placed directly under the concrete blocks. Since concrete blocks weigh a lot, special equipment is used for the construction of the precast foundation. The blocks are stacked in the same way as a brick - with ligation of cement-sand mixture. At the device of the monolithic foundation, first, from planks up to 5 cm thick, knock down the formwork, which is fastened with struts. 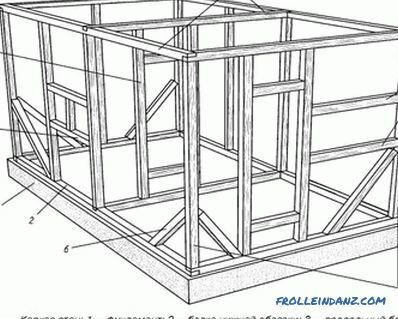 Alternatively, collapsible formwork frame-shield type. The walls of the structure should be vertical. The height of the formwork is made under the foundation, which must be 0.4 m higher than the ground level. For the reliability of the insulation layer of the foundation sole, the roofing material laid on the bottom should be brought up to the top. Then the skeleton is made of reinforcement. The rods should have a size in cross section up to 1 cm. The required number of segments is fastened together by welding, after which the frame is placed in a trench on previously prepared supports. Fill Now it is the turn of pouring concrete into the formwork. This work is carried out in stages with the distribution of layers with a thickness of up to 0.2 m. There should be several entries and after each of them the concrete should be vibrated. After that, air bubbles come out, and the foundation becomes solid and dense. 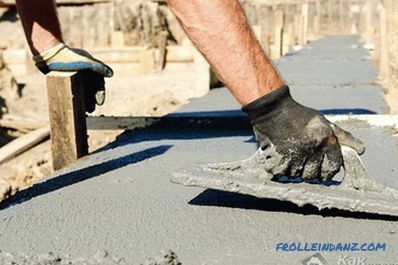 For the strength of the foundation, concrete must be prepared of medium consistency. In order for the foundation to completely dry after pouring, you need to wait some time — about a month. In the first days you should not forget to pour water over the structure. Thanks to this, the concrete will not crack. After the concrete has hardened, the formwork is removed, and waterproofing works are carried out using rolled materials or bitumen mastic. Then the edges of the foundation fall asleep, and this work is done carefully - waterproofing The foundation must remain unharmed. When the soil on the construction site is crumbling, under brick house arrange pile foundation, which can withstand a large load. 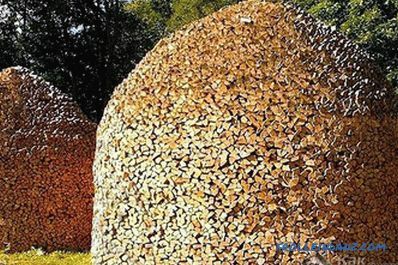 Thanks to piles, the load is redistributed and its main part falls on soils of high density, lying at a considerable depth.This foundation is designed in such a way that the piles on top are interconnected by a grillage, which is a support for the walls of the building. The pile foundation can also be constructed on soils of high strength. This allows you to save on materials and reduce the amount of excavated land. The disadvantages of the pile foundation can be attributed to the need to use in the work of special equipment for driving piles into the ground or drilling wells. 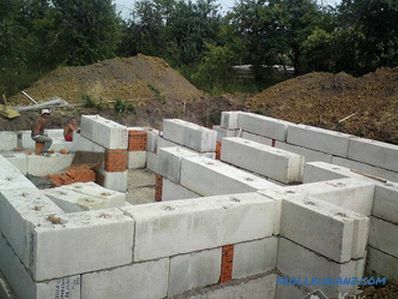 Pile foundations are different, but a bored reinforced concrete foundation is suitable for a brick house. With this kind of foundation piles have wide soles. First, the construction site is cleared, the turf is cut and the layout of the future foundation is made. In the places where drilling will occur under the piles, marks are made. According to the project, distances are measured from corners and small pits are dug in certain places. They will be reference points for the drilling machine. Then, with the help of special machines, wells are drilled in the soil for piles. In parallel with drilling, you need to prepare reinforcing rods and weld a frame from them, which should protrude above the ground by 0.3 m. In the future, a framework for a grillage will be attached to this structure. If the piles need to be moved a certain distance above the ground, metal pipes of the appropriate diameter are used for the formwork. Bored base After the completion of drilling, some sand and gravel are poured into the bottom of the well. Then, the finished skeleton of reinforcing bars, which is poured with concrete, is lowered into the well. To the foundation was monolithic, the concrete must be settled, releasing air out of it. 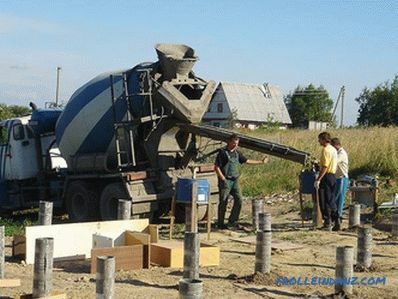 If there is a concrete mixer on the site, the concrete can be prepared at the construction site. While the concrete in the wells over time turns into strong piles, the framework for the grillage is welded. Then the frames for the piles and the grillage communicate with each other. 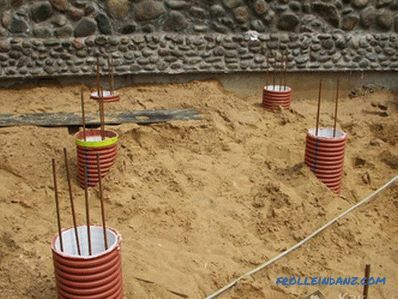 Then for the reinforcement construction of the grillage is formwork. 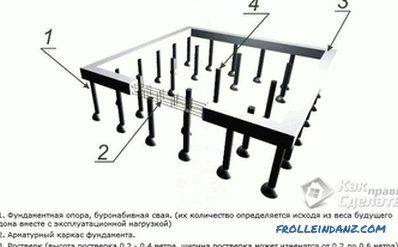 For the formwork for the grillage, it is best to use the prefabricated option. This formwork is easier and faster to install. In addition, with this option, the grillage will have a relatively better quality. After installation of the structure, concrete is poured into the formwork. Just as in the previous version with a strip foundation, the work is carried out in several passes, while the concrete is settled and compacted. After some time, the foundation will dry out and get stronger. Ready grillage must be waterproofed. A slab foundation can still be built under a brick house. In fact, it is a solid reinforced concrete slab that can withstand the load of the entire building built of brick. One of the important advantages of the slab foundation is that the soil movement does not affect its integrity and strength - neither vertical nor horizontal. Mostly such a foundation is built on wet soils, as well as those that are prone to heaving and subsidence. the bottom of the deep-seated The foundation is located slightly below the mark of freezing of the soil. 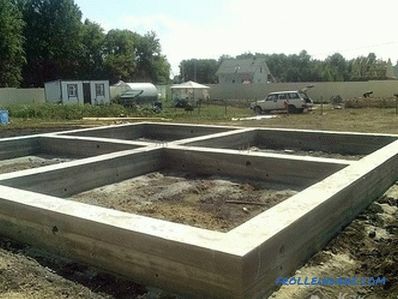 To build this foundation, you need a solid or lattice plate, which includes rigidly connected precast reinforced concrete beams, reinforced concrete plates and high-quality concrete. The most popular of all the options is a slab foundation of a shallow type. It is relatively economical in terms of labor costs and the amount of concrete needed. A slab foundation is built differently than other foundations. The work performed at the initial stage is no different. Then the ground is selected to a depth that should slightly exceed the thickness of the foundation under construction. The surface is leveled on a certain area and a layer of sand and rubble is filled. The cushion is properly leveled and compacted. Top poured a little lightweight concrete. 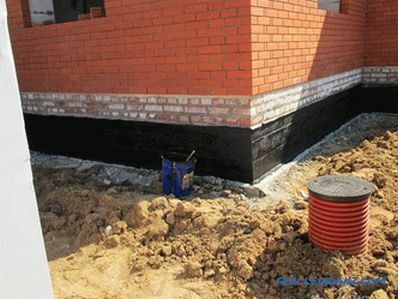 When constructing a slab foundation, high-quality heat and waterproofing performance is of particular importance. In this regard, first, the roofing material is laid on the lightweight concrete, on which the foam is laid. Materials for hydro and thermal insulation, you can choose at your discretion. The formwork is knocked along the contour of the future foundation, for which you can take boards up to 5 cm thick.Strong struts are made for the formwork elements. A reinforcement cage is manufactured right on the construction site. It is welded from sliced ​​metal rods and looks like a mesh. Finally pouring concrete. Filling is carried out in one go. Flooded concrete is subjected to shake, after which it is left to freeze. In the first days, so that the slab foundation does not crack, it must be watered.